I know there have been a lot of these kinds of posts lately and I have been trying to think of ways to start off this post and not go into the detail of my career back story like a lot of folks have done. 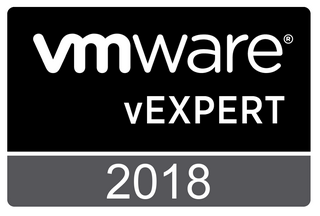 I am instead going to focus on how VMware has played a part in my career. I have been in awe of VMware tech for over a decade. My journey started with VMware Server back in 2008. I was amazed at the ability to run multiple OS's on one physical piece of hardware. I worked with VMware Player as well early on and I had always been a windows guy prior to this, but wanted to start learning Linux. This was a great way for me to try it out and get more familiar with it without all the pain of finding the correct drivers and getting all the hardware to be recognized etc, so I could get a functional machine. I used it as a testbed and learning platform to get more familiar with it. I had the privilege of flying out to Palo Alto to VMware HQ to attend the VMUG Leader Summit last week. I had so much fun connecting with old friends and meeting new ones. Leaders from all around the world were hosted by VMware on campus. We had a great lineup of speakers and activities waiting for us when we arrived. We had the honor of a special talk from VMware CEO Pat Gelsinger. I was excited to be one of those new leaders and a first time summit attendee. It was a bit surreal to be sitting in the Elastic Sky theater listening to a talk by Pat Gelsinger that he had made special for us! 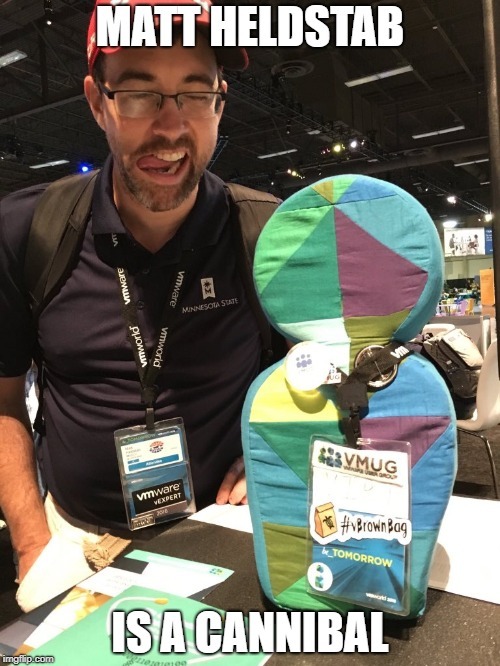 Now that my twitter feed has calmed down a bit from the good news VMTN posted, I wanted to get down a few thoughts. 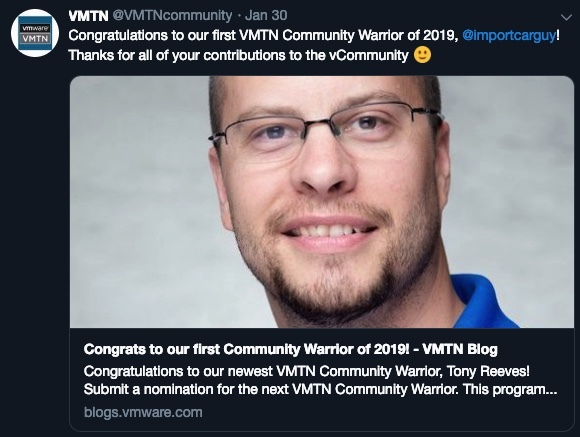 I am humbled and honored to have been selected as the Q1 2019 VMTN Community Warrior. Britton and Heath Johnson both have always been encouraging and helped me step out of my comfort zone. This was a very exciting VMworld for me this year. I had so many things lined up before I headed out to Las Vegas. 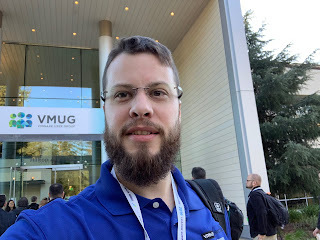 As always it was great to meet so many of you that I have only known online through twitter, as well as reconnecting with friends made at past VMworld and VMUG events throughout the country. This truly is a vCommunity like no other! I was fortunate enough to be selected as a Tech Field Day Delegate this year and spent time in the suite at the Delano hotel for meetings with 3 different vendors as they presented their solutions to the delegate panel. This was my first experience and it was a lot of fun. I will be making a separate post on this event. We met with StorageCraft, Netapp and Dell/EMC and they presented various solutions. The event was streamed live on www.techfieldday.com but you can go back and watch on the Tech Field Day YouTube channel here to catch the recordings. Huge shout out to Stephen Foskett for inviting me and his hospitality while at the event. It was great to get to know other past delegates as well. I did a guest spot on the Virtually speaking podcast with Pete Flecha and John Nicholson. This was a lot of fun as well. We talked vSAN, and community involvement so look for this segment in a future episode. Pete and John do a great job on this podcast and its been a great show to listen to over the years so it was very exciting to be a guest on the show! I appreciate it guys! My buddy Britton Johnson had told me he couldn't go to VMworld this year, but he showed up and surprised me on Sunday night. He was selected as this years VMware NSX roving reporter and I was interviewed by him for a short segment that you can view on the NSX YouTube Channel here. Britton and I also did short video review segments of the conference on our YouTube channel here. We tried to recap the days events quickly while they were still fresh in our minds. We also recorded a recap video on my flight home. This year I met so many people. Thanks to all those that came up and said hello! It was a very busy conference, but a lot of fun as well. I was able to see my fellow Wisconsin VMUG leaders at many different points during the conference. I was able to participate in a Home lab Panel at the VMUG booth with several other great folks such as Valdecir Carvalho, Mark Brookfield, Craig Herring, and Alastair Cooke. We gave tips from our home lab expereinces and answered questions from the audience and I hope it helps get some of you out in the community interested in building your own lab or helps you improve your current one. 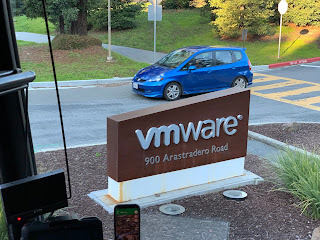 Very much enjoyed hanging out with my buddy Jase McCarty at the vSAN party and many others at the VMware Code hackathon Monday evening was a great time hanging out with friends and geeking out. Tuesday night was the vExpert Party at the Pinball Museum, and Veeam party and that was pretty cool as well. I ended up skipping the VMworld Fest party and just hung out with my friends Joe Houghes, Ken Nalbone and Chad Roth at a VMworld LAN party. We played some games and had a great time chatting. I attended some great sessions on vSAN. One with Pete Koehler and John Nicholson on The vSAN I/O Path Deconstructed Deep Dive that had some very interesting points getting down into the nuts and bolts of how vSAN works. That was very cool to also understand why some of the design decisions were made the way they were. I also really enjoyed Christian Dickmann's session on future looking vSAN releases and features. 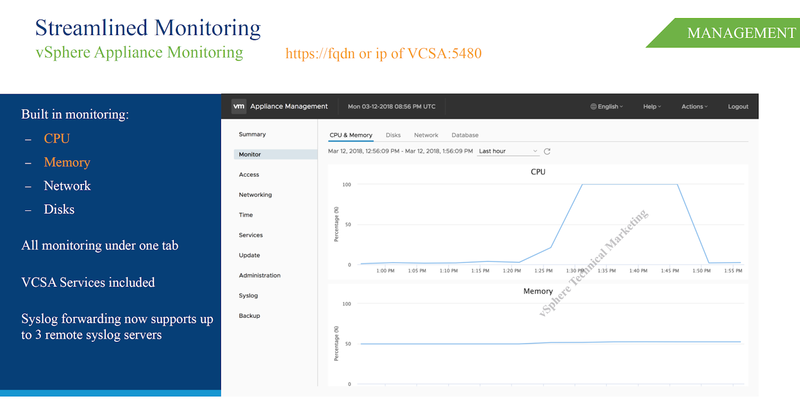 There is some very exciting stuff coming down the road for that, including major improvements to the vSAN Capacity management screen with usage projection. Another very cool feature they are looking at adding in is VUM based firmware updates, having just gone through a lot of firmware upgrades in my production vSAN this would come in quite handy! I will leave you with a few photos from the event and the great folks I got to hang out with! Until next year in San Francisco I look forward to seeing you all at VMUG's and saying Hi on Twitter! Looking forward to the Cinci VMUG Usercon and meeting folks next week! Cheers! 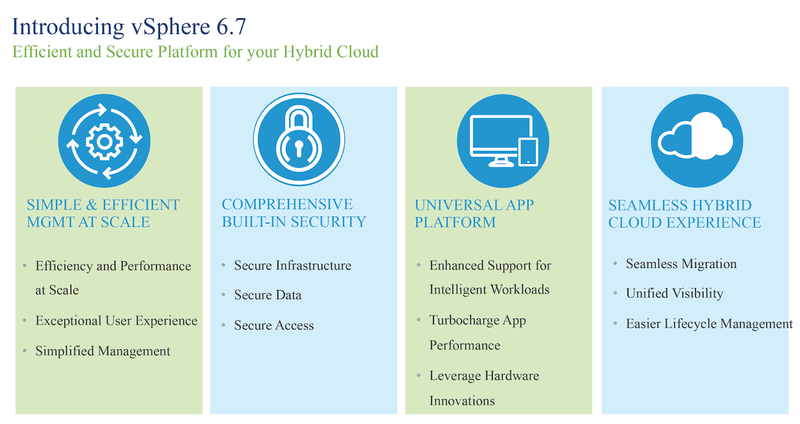 Today marks the release of vSAN version 6.7 along with vCenter and vSphere 6.7. The versions line up now across those three products which will make things a lot less confusing, so we are already off to a great start. There are many significant improvements to this version, and I was fortunate enough to be part of the blogger early access program to get a sneak peak at this release from the marketing team. I will go over a few things that they shared with us in this post. 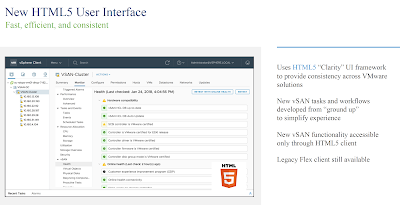 HTML5 client integration for vSAN is almost at feature parity with the flex web client. 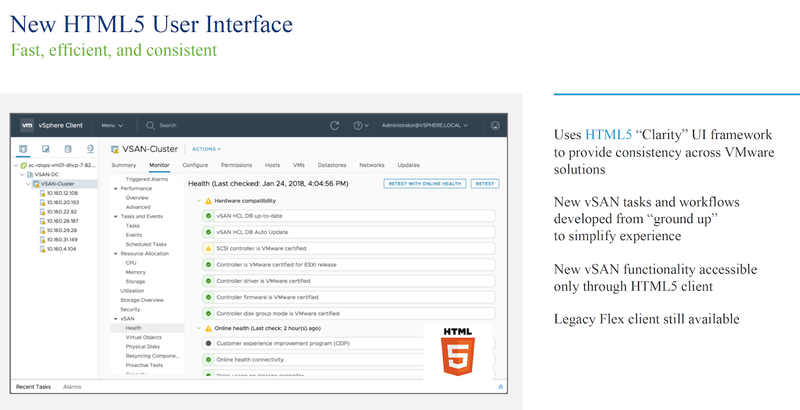 vSAN workflows have been optimized for less clicks and a more efficient user experience. Support will still continue for the Flex web client, but new features going forward will only be available through the new HTML5 interface. This will be much nicer to have an interface free of the flash player, and it is very fast in comparison! Native vROps dashboards for vSAN are now available in the vSphere Client. Quickly see the basics like health and more, or click to move to the vROps console for the full vSAN dashboard. I was fortunate to be part of a blogger vExpert early access program and got to see the new product version before the launch. 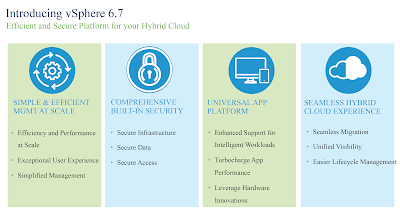 Having taken part in the vSphere beta for the past few years, I have been very much looking forward to this release. I was under embargo but can now share some of these things with you as that has been lifted as of today. The Clarity UI is used for the installation. This is a nice new look for the installation and upgrade processes. One of the main benefits now is a browser and platform agnostic approach to the install. 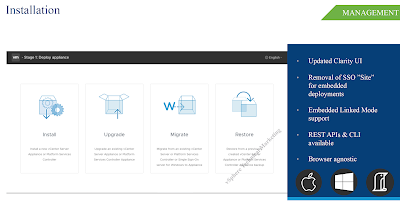 vCSA migration now supports your current custom ports for services during the migration process if you have changed any of the default ports on your install these settings will be preserved on the new vCSA.